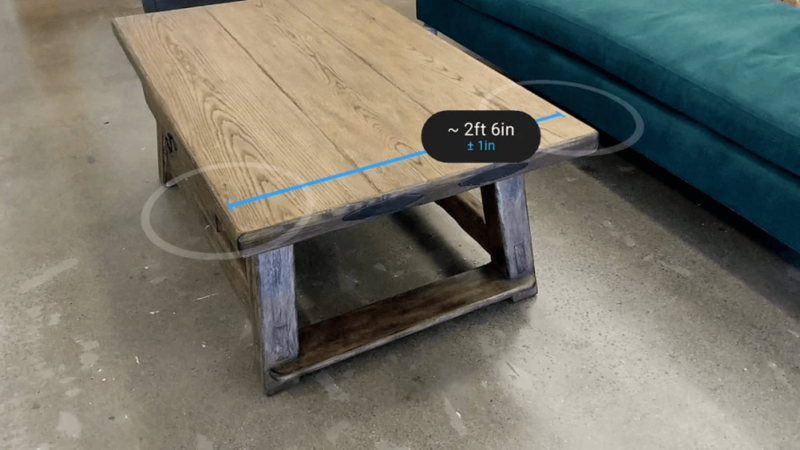 Google Measure, the digital alternative android app for anyone not having a physical tape measure, has recently received an integral update. The app, contrasting with its earlier version which was limited to Google’s AR platform Tango, will now work on any smartphone supporting ARCore. The AR-based app is simple and faster enough to use. All you need is to move your phone to evaluate a scene and then drag it a little around the object to draw a virtual line that measures it. The app, when tried practically, shows almost accurate value. Plus, it warns itself that the values showed might vary by plus or minus one inch, which is really commendable. So, it is advised to use it for rough measurement chores only; do not use it in a critical environment. Another important feature of this app is that it allows you to take a photo so as to save and check the measurements anytime – cutting down the need for taking measurements again. This is really cool, especially if you are into furniture industry where you have to work with the same measurements for a longer. Besides, the app enables the Android mobile users to switch between imperial and metric units from the settings So, can delimit the measurement units as per your requirement and enjoy the freedom to measure effortlessly in any part of the world. This update, called Measure 2.0, will fuel the battle between the two top tech giants – Apple and Google, since Apple has also experimented with their AR skills to upgrade their Measure app with the facility to provide more precise values in the upcoming iOS 12. And as per the predictions by the tech gurus, the Google Measure app will continue to get better with the help of Machine learning and Object-recognition technology, which means the competition is going to reach another level. So, remain excited! When it comes to device compatibility, the Google’s Measure application will work on numerous ARCore-supported devices, including but not restricted to, Asus, LG, Motorola, Google, Samsung, Xiaomi, HMD Global, Huawei, and Sony. So, if you have any of these devices, download the app from here.